PORTLAND - A task force convened by the federal government is recommending that wildlife agents get more aggressive about trapping and killing sea lions in the Columbia River. In recent years, large numbers of sea lions have swum upriver to Bonneville Dam to feast on threatened salmon runs. A task force of state and tribal wildlife managers, fishermen and outside experts concluded that hazing nuisance sea lions with firecrackers and rubber bullets has been ineffective. They're also underwhelmed by the results of limited removals of the hungriest sea lions. Tribal fishery scientist Doug Hatch argues for giving wildlife agents more latitude to trap and kill California sea lions feasting on wild salmon. Doug Hatch: "We need to capture more animals to see if that will get the effect that we were hoping to get which is predation reduction down to less than 1 percent." Animal rights activists not only oppose more killing of sea lions, but want the whole program stopped. The Humane Society and others argue trapping and killing is futile because new sea lions will always come in to replace predators removed. The task force recommendations now go to the federal fisheries service, which can approve or ignore the input it solicited. 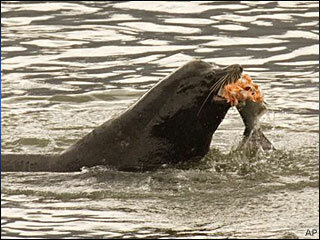 Task Force Recommends More Salmon-Eating Sea Lions Be Killed <-- Listen at original site.